Lila Jaber is translating her own success into helping other women succeed. About 10 years ago, attorney Lila Jaber went to a meeting with a client at a Cabinet-level state agency in Tallahassee. As she arrived, her male co-counsel, whom she hadn’t met previously, asked her to get him a cup of coffee. If he had done his research, he would have known Jaber — the lone female lawyer in the room — was nobody’s administrative assistant. That low-key approach has worked well for Jaber, now a shareholder and government affairs practice leader at Gunster, Yoakley & Stewart in Tallahassee. 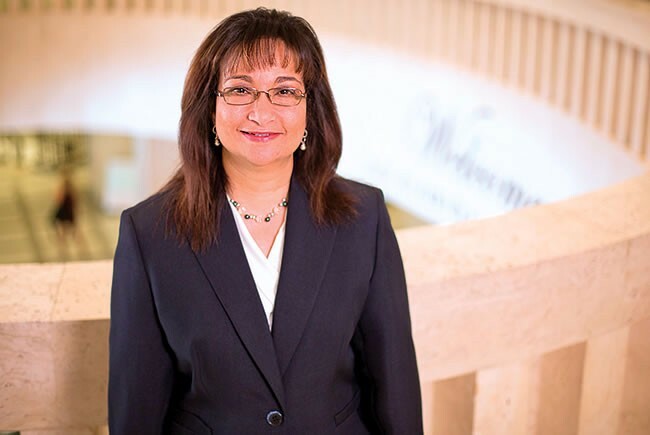 Earlier in her career, she worked her way up through the legal department of the Florida Public Service Commission to chair the state’s utility regulatory board. “I’d like to think people would say I’m hard-working, honest and diligent,” she says. Jaber, 50, grew up in Sanford as the daughter of Palestinian immigrants. Her parents started a business selling stereo equipment at a local flea market until they could open a music store. Eventually, they also bought into convenience stores and owned several around central Florida. After law school, she came across an ad for a staff attorney with the water and wastewater division of the PSC, based in Tallahassee. Although she had not envisioned a career in utility law, she pursued the job and got it. A hiring manager later told Jaber that she had been chosen because of her small-business background. At 34, Jaber applied for an appointment on the five-member PSC board under then-Gov. Jeb Bush. In 2000, with her parents looking on, Jaber was sworn in and served two terms as both commissioner and chairwoman. In 2005, she left the PSC for the Akerman law firm. Five years later, she was hired to lead the government affairs practice at Gunster. Today, Jaber oversees Gunster’s Orlando, Tallahassee and Tampa offices. Meanwhile, she makes a point of being civically engaged — she’s a past chair of Leadership Florida and a former board member of Workforce Florida. Along with her husband, Saed, she owns a cigar store and fashion boutique in Tallahassee. Recently, Jaber turned 50 and began contemplating her responsibility to help other women succeed. In 2015, she launched the Florida Women in Energy Forum, an annual event designed to highlight the sector’s importance to the state’s economy and to draw attention to career opportunities for women. Jaber says that as a minority woman, she sometimes has felt the need to work the longest hours of anyone — even if instances of bias, like the one she experienced some 10 years ago, are becoming more rare. Background: Jaber’s first job out of law school was as a staff attorney for the Florida Public Service Commission, which regulates the state’s utilities. In 2000, then-Gov. Jeb Bush appointed her to the five-member PSC board. See other stories from Florida Trend's October issue.